Drumming: Simple drumming behavior is designed to make noise, either to attract a mate or advertise that nearby territory is claimed. Damage caused by this type of pecking is minimal but may lead to additional problems, and the constant noise can be frustrating. Feeding: Woodpeckers forage for insects by prying or drilling into wood for different types of beetles, larvae and other pests. If the food source is large, damage from woodpeckers can be quite extensive, though the holes are often shallow. Nesting: Woodpeckers are cavity-nesting birds that require a hollowed out nesting site, and extensive drilling in one location may be excavation for a nest. This damage will be localized in one area, though several other test sites may be excavated to a lesser degree. A nesting hole will be quite large and deep. If you understand why woodpeckers cause damage, you can take more effective steps to discourage this unwanted behavior. There are two approaches to discouraging woodpeckers from causing damage. The birds can be completely deterred and forced to move elsewhere, or they can be simply redirected to a different but nearby area. Depending on the circumstances and the type of damage the birds are causing, birders might want to keep the woodpeckers nearby, but if they are problematic, complete woodpecker deterrent tactics may be necessary. Redirecting woodpeckers can keep them in the same region but will discourage them from drilling, pecking or drumming. Tree Removal: Remove large trees or prune branches near the house or wherever the birds are pecking so they will feel more exposed and vulnerable. This can encourage them to stay in thicker cover rather than pecking on the house. Replanting other bird-friendly landscaping such as flowerbeds and shrubs can make the yard just as attractive to birds without encouraging woodpecker activity. Feeding Woodpeckers: Instead of allowing woodpeckers to forage for insects on a wooden house, provide better foods for woodpeckers to give them an easier food source. Suet, mealworms and jelly are all superb choices the birds may prefer. Drumming Locations: Leave a nearby hollow tree or stump in place for woodpeckers to drum more conveniently than making noise where they aren't wanted. Placing this distraction further away from the house can also make it quieter for everyone nearby. At the same time, place foam or padding behind the unwanted drumming area if possible to muffle sound so the birds will move on to a better location. Pest Control: If the insects are feeding on the wooden structure of the house, contact a pest control company for an insect inspection. Pest treatments to eliminate those insects will remove that tempting food source and cause woodpeckers to feed elsewhere. Repair Holes: Use wood putty or replace shingles and planks where woodpeckers have already successfully drilled. Paint or stain over the repair to further disguise the site and prevent any insects from invading the weakened area. This will remove the visual clue that the area is good for drumming or drilling, and the birds are more likely to move on. If the birds do not respond to simple redirection, stronger ways to get rid of woodpeckers completely may be necessary. Scare Techniques: Scaring birds can be effective to keep them away. Loud noises, including recorded bird alarm calls or wind chimes, are one option, or an attentive birder can spray the birds with a jet of water from a garden house whenever they start drumming. This will take diligence, however, and will not be effective if the birds are not scared away each time they begin pecking. Reflections: Adding bright, reflective objects over the area where the birds are pecking can frighten them away. Metal pie plates, mylar strips, old CDs or small mirrors hung from strings or fishing line over the pecking area are good options, but they must be free to swing in the breeze to be more unpredictable. Small metal pinwheels with reflective sections can be similarly effective. Movement: Windsocks or flags hung in the same area where the birds are pecking will help deter them with random movements and fluttering noises that can be frightening. Colorful objects are the best choice and may be more effective than simple windsocks. Covering Wood: Covering the wooden areas woodpeckers find attractive with foam, netting or cloth can keep them from reaching the wood to peck. Adding chicken wire or fishing line 1-2 inches away from the surface can also keep the birds from reaching the wood, but it will need to be left up permanently to be most effective. Decoy Birds: Placing plastic or carved owls and hawks near the area where woodpeckers are pecking can be effective for a few days, but the woodpeckers will soon become accustomed to the decoys. This can be useful for initially deterring woodpeckers, however, until stronger methods can be arranged. To be most effective, combine several woodpecker deterrent methods at once. Birds will quickly get used to one method and may resume their pecking, but several methods can be too troublesome and they will seek easier areas for their activities. 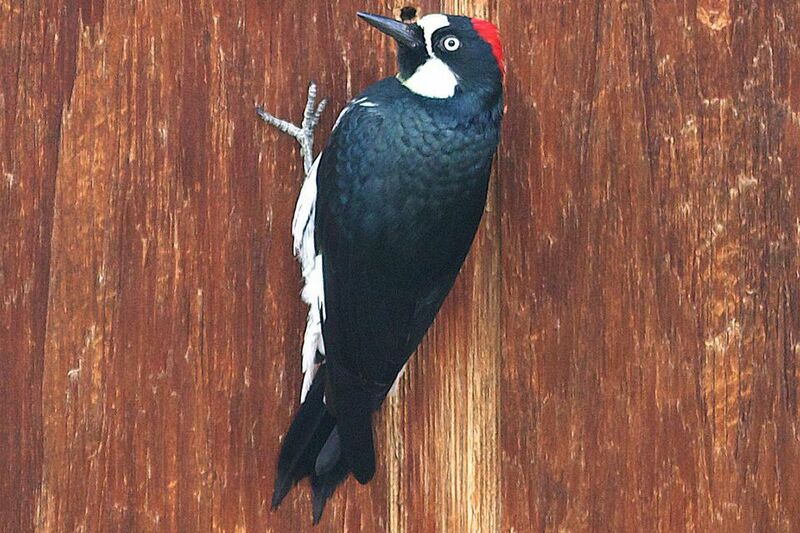 No matter how annoying woodpecker pecking may be, some methods to get rid of woodpeckers should never be used. Do not apply sticky or greasy products to the wood the birds are pecking. These products can coat the birds' plumage and can be dangerous or toxic. Do not damage or remove eggs from an established woodpecker nest. Woodpeckers are protected under the Migratory Bird Act and such actions are illegal without the proper authorization. Do not injure or attempt to capture the birds. This is also illegal under the Migratory Bird Act and can result in fines or jail time for any violations. In extreme cases, even using several woodpecker deterrents may not be effective. If this happens, contacting local wildlife control offices or pest control companies with experience in discouraging pest birds can be a last resort to stop woodpecker house damage. Most birders, however, have no trouble discouraging woodpecker pecking, it just takes time and experimentation to determine the most effective methods for different woodpeckers on different houses.